Blockchain-powered Exodus 1 device is available from today for cryptocurrency fans. HTC has fully taken the wraps off its blockchain-powered Exodus phone for the first time. 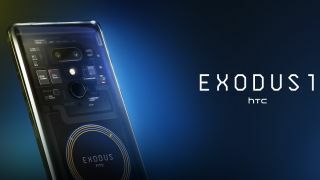 The Taiwanese phone maker has revealed the official launch of the HTC Exodus 1, which is available as an early access edition for fans in 34 countries today, including the US, UK, Hong Kong and Singapore. However you'll only be able to get your hands on the device by spending hard-earned cryprtocurrency, with the device costing 0.15 BTC or 4.78 ETH through HTC's own site, and shipping sometime in December. HTC, which is marking 10 years since the unveiling of its first Android phone, is labelling the launch as a "1.0 version" of the Exodus, and is now inviting the cryptocurrency community to evaluate and help improve the device with its feedback. "EXODUS 1 is a foundational element of the crypto internet," says Phil Chen, decentralized chief officer at HTC. "For digital assets and decentralised apps to reach their potential, we believe mobile will need to be the main point of distribution. We look forward to partnering with developers in the blockchain community to usher in this vision." HTC is looking to support and build upon the initial launch by releasing APIs to allow third-party services to access the Exodus' secure hardware systems. The device is unique in offering what HTC calls a "secure enclave" away from the Android operating system (the phone will run Android Oreo) directly into the hardware itself. This means it is even harder for anyone to gain access to your cryptocurrency wallet, and could even be used to store user data such as fingerprint and facial scans in the near future, offering a locked-down space to safeguard your most personal information. If anything does happen to your device, you can breathe easy, as HTC has imbued the Exodus with a social-themed security protocol that sees users nominate several contacts to hold a piece of a unique security key - and only bringing all of these pieces together will unlock the device.